So you need car insurance but don’t want a long-term commitment of 6 months to a year. You might be ready to sell your vehicle or put it in storage and just need month to month car insurance. There are many reasons why you’d want to purchase temporary auto insurance, but you’re probably thinking, is it even available? The short answer is usually no. Most insurers do not offer monthly auto insurance plans. Policies are normally bound for 6 and 12 months. There is a solution though, that you might have never thought of, that’s actually pretty simple. Almost every carrier now days allows for monthly payments. This means you don’t have to spend hundreds upfront to get auto ins coverage. Furthermore, many companies have no down payment options that can get you insured for free. Most carriers do require a down payment, however, of 20% to 25%, but there are direct providers like Rodney D Young that only require 5% down. For those on a tight budget, this can be a lifesaver. Your down payment will, in most cases, cover you for the first month. So if you have a $1,200 twelve month policy, with a 5% down requirement, you will just need to pay $60. The remaining 11 months would be billed in recurring installments of $104. So in this example, you could get 2 full months of coverage for just $162. That’s a good deal because you don’t have to tie up a huge amount of cash to get covered. So it is possible to get cheap, monthly coverage, but only if you get a low down and make payments. A 12-month policy that is paid monthly is only slightly more expensive than if you pay for it in full upfront. So it makes sense for most people that don’t want to tie up their precious cash to get a monthly payment plan. If you need to cancel your coverage for whatever reason, you can legally do so after the first two months and stop making payments. This strategy effectively means you can get short term auto insurance for just 2 months at a very low rate and then simply cancel the policy. If you want to get one month auto insurance then you need to find companies that offer short-term policies, which can be difficult. 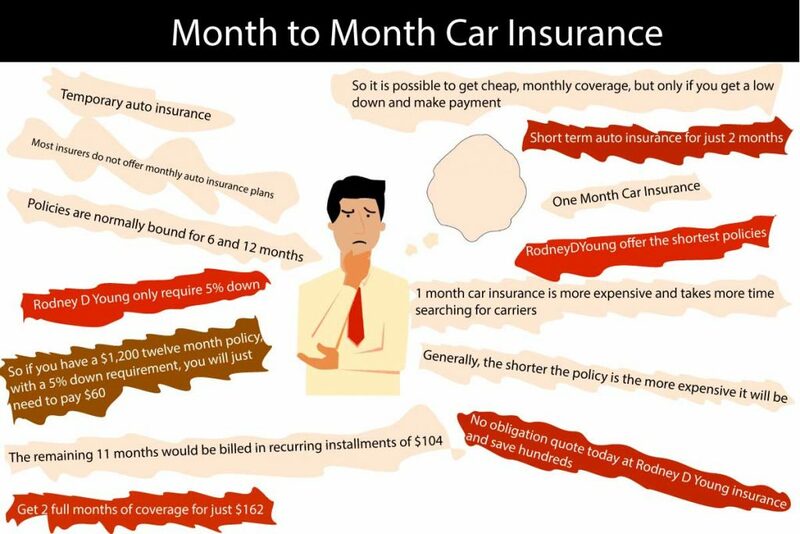 There are some insurers that offer 3-month policies but they are few and far between. Use free quoting services from sites like RodneyDYoung to find carriers that offer the shortest policies. If you find a short-term plan and just want 1 month of coverage, you can buy the policy and then make a written request to have it terminated after one month. You should also follow up with a company representative to make sure your request was noted and the coverage is set to cancel after 1 month. Generally, 1 month car insurance is more expensive and takes more time searching for carriers. It may make sense though under certain situations. For example, a military officer that will be deployed overseas for a year and just needs one more month of coverage. Generally, the shorter the policy is the more expensive it will be, so take this into consideration when searching for plans. The best place to find cheap monthly car insurance is online. There are direct providers that specialize in building flexible policies that fit your needs. Some insurers actually let you select the down payment amount and policy terms. This means you can build a plan with the coverage you need at the lowest possible rates. Never before has it been so fast and easy to get insured for less. Get your free, no-obligation quote today at Rodney D Young insurance and save hundreds.